Batter Applicator BSJJ-200B - Hangzhou Expro Machinery Engineering Co.,Ltd. The machine is mainly made of stainless steel SUS304. BSJJ-200B batter applicator is design to apply watery batter onto products. 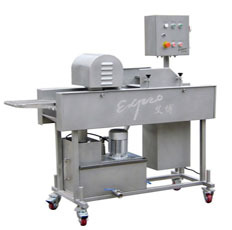 it is ideal for thin products processing,such as fish fillet. Unwanted batter will be removed from the top and bottom by blower. This machine features stainless steel wire belt and mechanical speed adjustment. It is especially suitable for small scale, multi-type products or lab testing.